I first heard of the Teenage Mutant Ninja Turtles, I believe, in the summer of 1985. They were being used as art on a flyer for that year's Mid-Ohio-Con and I remember thinking, "You have GOT to be kidding! How does that make ANY sense?" The art was actually an early drawing of them, too, where they were still all lanky and a little goofy looking prior to their actual publication as a comic. (The following year, Mid-Ohio-Con was all about John Byrne and his then-recent revamp of Superman.) I don't recall if either Kevin Eastman or Peter Laird were at the show as I was very preoccupied with the Fantastic Four at the time, pretty much to exclusion of everything else. At some point in the next couple of years, my father had begun buying comics here and there, and eventually picked up the four TMNT paperbacks that First Comics started putting out in 1986. By that point, I had more or less exhausted my own comic reading material, as well as my funds for obtaining any more, so I started reading Dad's comics. Including those TMNT books. So by the time the cartoon came around in late '87, I was pretty well-versed in the characters. I watched the cartoon, read all four TPBs my dad got, bought the action figures, got the role-playing game and played the arcade game. And then I went off to college. I don't think I've read, heard or watched a single Turtles story since then. They were just interesting enough for me to hold my attention at that time, but I think it was largely predicated off the momentum Eastman and Laird generated in their first dozen issues of the comic. 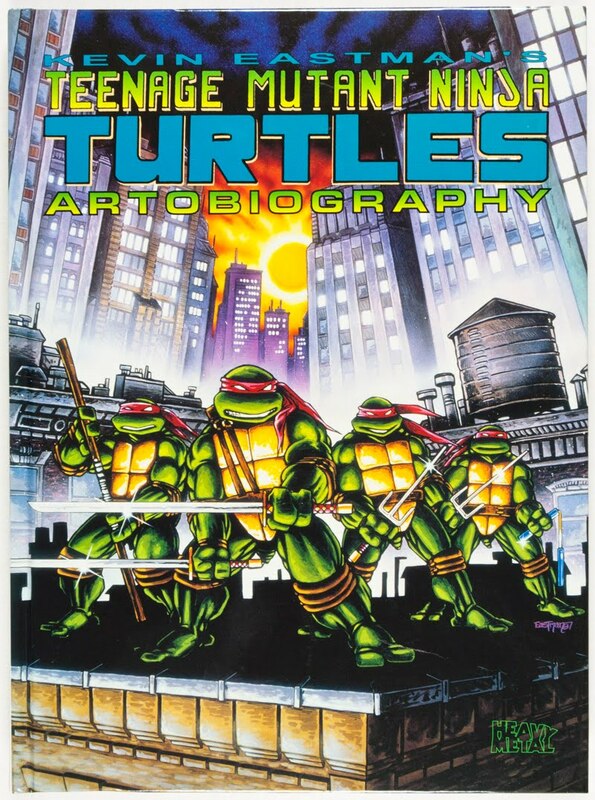 So that's me coming to Eastman's Teenage Mutant Turtles Artobiography, which I won earlier this year. The book is a history of Eastman's creative work on the Turtles. There is LOADS of artwork. Lots of sketches, pencil layouts, pre- and post-toned comic pages, paintings... the works. Much of it is annotated with notes about what this piece was used for, and how that piece was developed. There's also something of an introduction that explains how Eastman and Laird got started, and a bit about their work process for those early issues. The book focuses mostly Eastman and Laird's collaborative efforts. There's a few pieces about Eastman's solo stories, and almost nothing regarding the cartoon or the movies or the action figures. I think a passing mention or two of each, but that's about it. The book is really about Kevin Eastman's Turtles. With that in mind, it's an interesting look at Eastman's early development as a comic book artist. There's a very clear progression in his methodology and technique. (The book is arranged chronologically, so this the progression is easily apparent.) Eastman makes note, from time to time, too, of changes in style or direction. As I said, there's tons of art and much of it is annotated. If I had a complaint about the book, though, is that it's JUST annotated. There's not a lot of substantive text. Eastman does a sufficient enough job of explaining what we're looking at, but I would certainly be interested in hearing more. But if you want to study Eastman's art in detail, I can't imagine a better tome. Talk about an interesting progression, when I think on my own association. At some point I got hold of the four squarebound paperbacks of the original Eastman/Laird stories, which were of course quite different but enjoyable all the same. And then eventually the Turtles were just "over," and in one or other of my collection purges, pretty much everything went. Probably a bit of an overreaction, at least somewhat driven by an idea that ninja turtles were "for kids" (while, obviously, Spider-Man or the X-Men were mature works of literature), but ah well. What a fun stroll down memory lane.